I, Zajtseva Irina, am the head of collective nursery "Siberian Bear" and professional грумером. 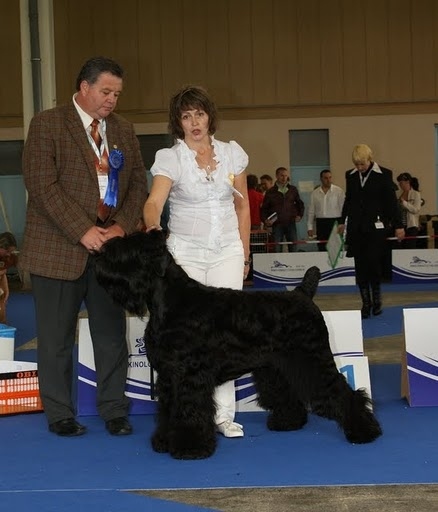 Has won the Siberian Regional competition grummer in section 2.5 hours (this time for a black terrier without a hairstyle of 6 months) with very worthy contenders. My experience of dialogue with breed has begun in 1987г. I was the head of section РЧТ in Regional Club of Office Dog breeding DOSAAF, and the head (breed) of Novosibirsk club of fans of dog breeders KINOS. Dogs of my own cultivation have appeared in 2001 From now on dogs of nursery have achieved excellent results! "The Siberian Bears" know all over the world, we are considered as one of the stablest nurseries. The considerable quantity of champions of Siberia were born in our nursery. We are proud of the dogs! Our nursery collective, me is surrounded with the friends-enthusiasts, betrayed to breed. We do not stop on reached and carefully we think over all are viscous nursery, hoping constantly to improve quality of received puppies. Probably, therefore we not so often have puppies. Our puppies are in demand at professionals. For us the MAIN QUALITY, instead of QUANTITY!